When I talk to people about content marketing and the need for quality content creation, they usually ask me why it matters. Here is why: Over the last few years, they way your prospects journey through the sales funnel has changed. It is no longer good enough to have a website that answers there product or service related questions (but you still need that). It is no longer good enough to post about the benefits of your products and services on your blog (although that is still a good idea). Today you need to demonstrate you expertise, and — more importantly — why your prospects need to be doing things differently than they currently are. That happens through content marketing, where every piece of information educates, informs, and persuades your prospects. Marketers at the largest companies realize this, and have started incorporating content marketing into their traditional marketing mix. 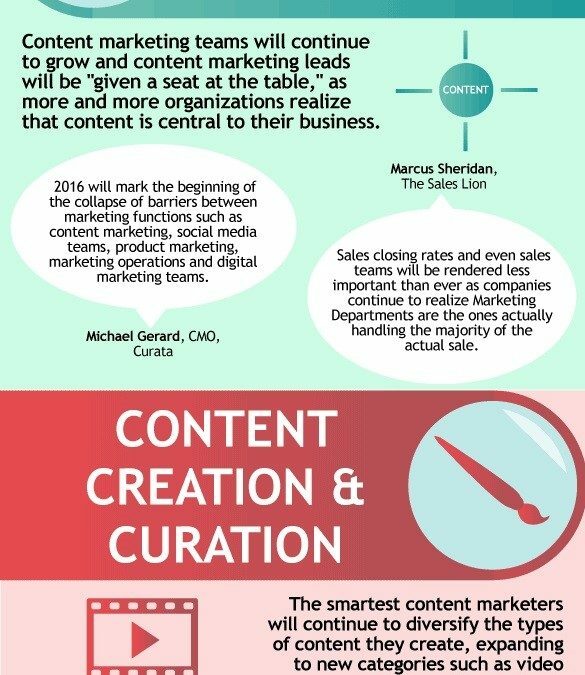 For fun, here is an infographic of the content marketing trends the experts at Curata, a content marketing platform provider, see for 2016. From increases in investment (both in dollars and staff) to exploring new distribution channels, this is the year that content marketing will become mainstream. The experts at Curata have spotted several content marketing trends for 2016.